Lock in a great price for Tryp São Paulo Iguatemi Hotel – rated 8.7 by recent guests! I’ve been a guest of this hotel since 2010. The location is one of the best in the neighborhood. The rooms are large. The shower is the best. However I’ve noticed in the last 12 month or so that the staff isn’t efficient as before (long lines at check-in/check-out) and the maintenance of the facilities isn’t as good as before (outlets not working, noise A/C, broken furniture, etc). Overall it is still a good choice if the price is right. The TRYP Jesuino, although looks older, seems better managed. Clean rooms and nice staff, best Tryp I have stayed so far (compared to Jesuino Arruda and Manuel Guedes)! Super comfortable, great breakfast, nice staff, perfect location. Great location, many restaurants, banks, in a walk distance. Great Location, old hotel, bad split air conditioner equipment. Pillow menu was surprising! Service room, and the kindness of employees. Breakfast was pretty good. The place is clean and very close to a lot of the business I needed to attend to. The bar is well stocked and I like the 24 hr room service option. Tryp São Paulo Iguatemi Hotel This rating is a reflection of how the property compares to the industry standard when it comes to price, facilities and services available. It's based on a self-evaluation by the property. Use this rating to help choose your stay! One of our top picks in São Paulo.Boasting an outdoor pool with city views, a spa and a fitness center, Tryp São Paulo Iguatemi is located in Itaim-Bibi, one of São Paulo's prime neighborhoods, and includes free WiFi. Air conditioning, cable TV and mini-bar are amenities included in Tryp's 4-star rooms. Bright and spacious, they offer contemporary décor and a work station. Room service is available 24 hours a day. 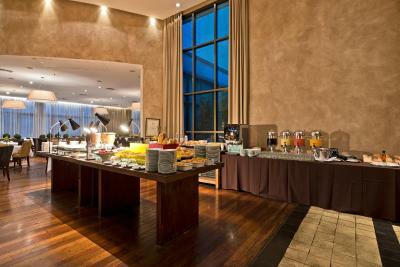 Guests enjoy a rich buffet breakfast that is served in the restaurant, with hot items, fresh fruits and various pastries. The restaurant serves international dishes, while exotic drinks can be ordered from the bar. Tryp São Paulo Iguatemi hotel spa provides massages, beauty treatments and physiotherapy sessions. There are also services designed for men. 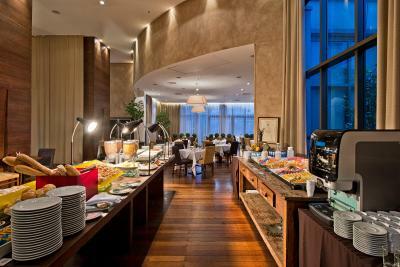 Hotel Tryp Iguatemi Sao Paulo is within walking distance from classy bars, restaurants and shops. Brigadeiro Faria Lima Avenue is 1 block away, and Iguatemi Shopping Center is 0.7 mi from the hotel. Ibirapuera Park is 2.5 mi from the property, while Transamérica Expo is 5.6 mi away. The hotel is 5 mi from Congonhas Airport. Guarulhos International Airport is 50 minutes away by car. This property also has one of the top-rated locations in São Paulo! Guests are happier about it compared to other properties in the area. When would you like to stay at Tryp São Paulo Iguatemi Hotel? 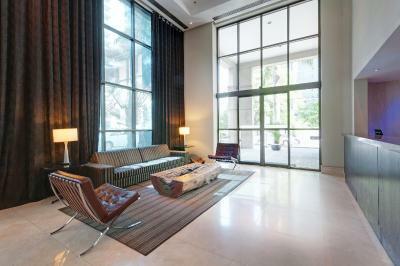 Located between the 2nd and 5th floors, this air-conditioned room features a TV with cable, a minibar and a work desk. The private bathroom features free toiletries, a shower and a hairdryer. Private parking is available on site (reservation is not needed) and costs BRL 22 per day. Located on the upper floors of the hotel, this air-conditioned room features a flat-screen TV with cable, mini-bar, tea maker and work desk. The private bathroom comes with free deluxe toiletries, bathrobes and slippers, and a hairdryer. Located between the 6th and 22nd floors, this air-conditioned room features a flat-screen TV with cable, tea maker, mini-bar and work desk. The private bathroom comes with free deluxe toiletries, bathrobes and slippers, and a hairdryer. Located between the 15th and 16th floors, this newly renovated, air-conditioned room features a 42-inch flat-screen TV with cable, LED lighting, mini-bar, a Nespresso machine, iPod docking station, work desk and heating. The private bathroom comes with free deluxe toiletries, bathrobes and slippers, and a hairdryer. House Rules Tryp São Paulo Iguatemi Hotel takes special requests – add in the next step! Tryp São Paulo Iguatemi Hotel accepts these cards and reserves the right to temporarily hold an amount prior to arrival. Please note, at check-in, guests must provide the credit card used to make the reservation. Please inform Tryp São Paulo Iguatemi Hotel in advance of your expected arrival time. You can use the Special Requests box when booking, or contact the property directly with the contact details provided in your confirmation. Reservations can only be guaranteed until 12:00 of the next day, after this time the guest will be charged accordingly to the policy conditions of the reservation and the room availability cannot be guaranteed. Please note that the credit card holder will be required to show a photo ID and the credit card used to book upon check-in. If credit card belongs to a third party, please contact the property for authorization. When booking more than 9 rooms, different conditions of rates, availability and payment forms may apply. The property will contact you after you book to provide instructions. Airport transfer is available at a surcharge and must be scheduled with the property prior to arrival. Guests requesting invoices on behalf of companies need to contact the property in advance. The property will provide you further details. The property will make a pre-authorization of the credit card in guarantee at any time after booking. Please inform Tryp São Paulo Iguatemi Hotel of your expected arrival time in advance. You can use the Special Requests box when booking, or contact the property directly using the contact details in your confirmation. bad split air conditioner equipment. A bit of paint would improve the general look of the hotel. the pool is only 90 cm deep, not suitable for swimming. Room looked bigger than it is. The international calling from the hotel did not work. My cell phone did not get good reception in the building. The staff is professional and were very good with English but not prompt with requests and they were not particularly helpful at first. I was made to feel that I was imposing on their time when making requests. The business center is not open 24 hours. The breakfast options aren't great and they don't label the food in English so you can't tell what's inside pastries for instance, which isn't helpful if you are a vegan. Rooms are clean and the fitness facilities are also okay. The rooftop patio was small and very dirty with empty beer bottles left all around it. We never used it. Spacious and clean rooms (we go an upgrade). Card details were stolen in this hotel. Breakfast can improve - although it is not bad. Amazing location. Clean and bright large room. Very comfortable bed. Gym facilities only include 5 old cardio machines, a multi-resistance machine, a bench and some weights (up to 10kg). The swimming pool is also very small. Great, clean and spacious room in an ideal location close to many good restaurants. Staff were friendly. Gym facilities were a little basic, but did what they needed to do. Breakfast was good, although they run out of key items by about 10.